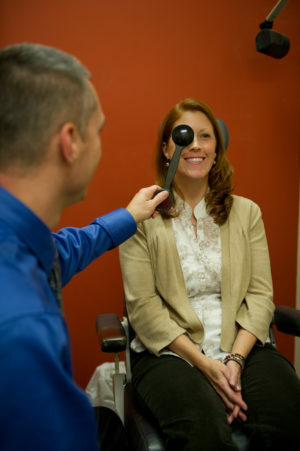 The eye exam is made up of two basic components: the refraction and the ocular health exam. The first portion or the refraction determines the best prescription for your glasses by having you (the patient) subjectively identify the best option. Our doctors allow you to try on the new prescription so that you can compare it to your current glasses in different settings such as reading and viewing the computer. The second portion of the exam is an assessment of the health of the eye and in many cases your overall systemic health. This frequently requires our doctors to dilate your eyes. This allows our doctors to examine the outside structures of your eyes, measure the pressure within the eye (one test for glaucoma), check for cataracts, and examine the retina or the very back of your eyes. The dilation specifically allows our doctors to examine the extreme edges of the retina to ensure that no problems exist potentially leading to vision loss.